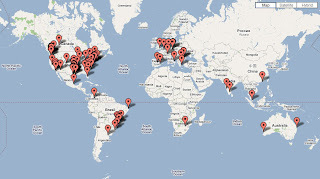 Every so often, its fun to post maps showing the last hundred visitors to our blog. Although the main Cold War Air Museum web site gets more total hits, the blog site gets a higher percentage of International hits. The higher number of International hits is an interesting aspect of blog linking as compared to the more standard Google searches for Museum topics that are directed to the main site. It is also interesting to watch the patterns change, The maps above are from three days apart. We thank everyone for coming to either site and hope that our blog helps bring visitors to the Museum and what we have to show and tell. 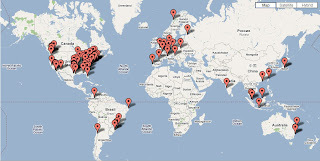 Wherever you are, let us know what topics interest you and invite your friends to come and visit too!